What's Next In The Kavanaugh Confirmation Fight? 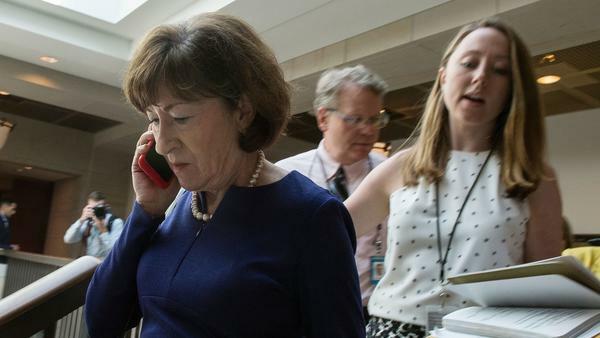 Sen. Susan Collins, R-Maine, talks on a phone while walking to a room on Capitol Hill to read the report on the supplemental FBI investigation into Supreme Court nominee Judge Brett Kavanaugh. After GOP Sen. Susan Collins of Maine came out in favor of confirming him Friday afternoon on the Senate floor, Judge Brett Kavanaugh is all but certainly headed for the Supreme Court in very short order. The Senate advanced Kavanaugh's nomination, 51 to 49, Friday. A final vote is expected Saturday. There was a lot that went down Friday. What exactly happened and what does it mean going forward? The political world was waiting for what Collins would say. After voting in favor of advancing Kavanaugh's nomination, Collins said she would announce later Friday afternoon how she would vote on Kavanaugh's confirmation. From the Senate floor, after praising Kavanaugh's judicial record and criticizing left-wing groups that opposed Kavanaugh, Collins said she believed Christine Blasey Ford was the victim of sexual assault, but that the facts presented do not mean Ford was assaulted that night or by Kavanaugh. "I found her testimony to be sincere, painful and compelling," Collins said. "Nevertheless, the four witnesses she named could not corroborate any of the events of that evening gathering where she says the assault occurred." She added, "The allegations failed to meet the 'more likely than not' standard" and, "Therefore, I do not believe these charges can fairly prevent Judge Kavanaugh from serving on the court." She then praised the #MeToo movement, saying it is "real," that "it matters" and "is long overdue." Collins also intimated that Ford may have been used by "people who wanted to engineer" Kavanaugh's defeat and "cared little about her well-being." What does this mean for other votes? Shortly after Collins' speech ended, West Virginia Democrat Joe Manchin, who is up for re-election this year, also announced he is voting yes. "I have reservations about this vote given the serious accusations against Judge Kavanaugh and the temperament he displayed in the hearing," Manchin said in a statement. "And my heart goes out to anyone who has experienced any type of sexual assault in their life. However, based on all of the information I have available to me, including the recently completed FBI report, I have found Judge Kavanaugh to be a qualified jurist who will follow the Constitution and determine cases based on the legal findings before him. I do hope that Judge Kavanaugh will not allow the partisan nature this process took to follow him onto the court." Manchin voted in favor of advancing Kavanaugh's nomination earlier in the day, but it was unclear how he would vote on final confirmation. It would have been quite the drama if Collins had announced a no vote, and Manchin would have been the deciding vote on whether Kavanaugh was confirmed to the Supreme Court. Instead, Collins gave Manchin a degree of political cover. Lisa Murkowski of Alaska voted against advancing Kavanaugh's nomination advancing to a final vote. That indicates she's unlikely to change her vote, because voting no on cloture for someone nominated by the president of your own party is a bold move. It signals she has real concerns that have not been allayed. It's hard to see how that happens in the next 24 hours when the FBI investigation is already wrapped up. Sen. Jeff Flake, another thought-to-be-wavering senator, also voted to advance the nomination and told reporters after the vote that he expects to be a yes on final confirmation. "I would think so," Flake said. He noted, "Unless something big changes, I don't see what would. But anyway I'm glad we had a better process. We needed a better process." A final confirmation vote is expected Saturday. It remains to be seen how other red-state Democrats will vote now that Collins and Manchin have all but guaranteed Kavanaugh's confirmation to the court. There are 10 Democrats running for re-election in states President Trump won in 2016, and the Kavanaugh confirmation battle has fired up the GOP base. Democrats Joe Donnelly of Indiana and Jon Tester of Montana announced their opposition to Kavanaugh Sept. 28, a day after the gut-wrenching testimony from Ford and Kavanaugh. Sen. Heidi Heitkamp of North Dakota, perhaps the most vulnerable senator up for re-election, also announced that she's voting no. Do any of those — or other — votes change? When could Kavanaugh be seated on the Supreme Court? As early as Tuesday morning, as NPR's Nina Totenberg reported on All Things Considered Friday. What could it mean for the midterms? All year, Democrats have dominated on who is more fired up for November's midterm elections. But an NPR/PBS NewsHour/Marist poll found Republican enthusiasm on the rise since the dueling Kavanaugh and Ford testimonies. Democratic enthusiasm is still high, but the gap closed significantly to a statistical tie. Does that last? Kavanaugh being confirmed will keep Democrats fired up, but was it a short-term bump for Republicans or does it recede? If Friday wasn't the vote to confirm Kavanaugh, what was it? Friday's vote was on what's known as cloture. That's whether to end, or close, debate. For this vote, that was to end debate on Kavanaugh's nomination and advance it to a final vote. Think of it this way: Don't you ever have those moments when someone just won't stop talking, and you want to say, "Enough already"? When they won't stop talking in the Senate, that's called a filibuster. And to cut them off in the Senate, you need 60 votes to do it. But not for Supreme Court nominations anymore. Why doesn't the Senate require 60 votes anymore to confirm a Supreme Court nominee? Democratic Leader Harry Reid, when he was majority leader in 2013, grew frustrated by Republicans' record use of the filibuster. Sen. Mitch McConnell, then minority leader, hatched a plan to thwart President Barack Obama from remaking the federal judiciary by aligning Republicans against Obama's nominees in lockstep. That made it impossible to get 60 votes, thereby making it impossible for Obama to get anyone through. In response, Reid threatened to change the rules and get rid of the 60-vote requirement for lower court nominees. McConnell persisted, and Reid changed the rules. McConnell then warned that he would up the ante and blow up the filibuster for Supreme Court nominees, and when he got in power, he did just that last year during the confirmation process for Neil Gorsuch. That leaves us where we are now with an acrimonious and pitched political battle, roughly along party lines, to vote through a Supreme Court nominee. OK, so the vote Friday was 51-49. Who voted and how? The key quartet everyone has been watching are Republicans Flake, Collins, Murkowski and Democrat Manchin. Three of the four voted for cloture to advance Kavanaugh — Flake, Collins and, surprisingly to some, Manchin. That was enough for a majority. If Manchin had voted no, would that have sunk Kavanaugh? No, because that would make it a 50-50 tie, and Vice President Pence would be called in to break the tie in his titular role as president of the Senate. Why would Manchin vote yes? He's is up for re-election in a very red state, West Virginia. Trump won West Virginia by more than 40 points. Manchin is favored to win re-election, but the Kavanaugh confirmation battle has fired up what was seen as a dormant Republican base. Manchin is trying to tread carefully and not jeopardize his chances. Do the senators have to vote the same way on a final vote? No. There's nothing stopping any one of them from changing their vote. It's a completely new vote. It is rare for someone to change a vote from one step to another, but it's not unheard of. Some senators are fine with advancing a nomination or bill to be voted on, but not OK with the nominee or the substance of legislation. In fact, last year, Collins voted yes in committee on Trump Education Secretary Betsy DeVos, but then voted against her in the final vote. Her reason: DeVos wasn't strong enough on public education. A committee vote is not exactly the same as ending cloture, but it's a decent corollary as a two-step process. Why might a senator change his or her vote from one step to another? Some senators object to the increased use of the filibuster and might want to uphold what they call "regular order." The late-Sen. John McCain, for example, voted in favor of advancing the GOP's Affordable Care Act repeal legislation to the Senate floor and then dramatically voted no on final passage. Some might want to thread a political needle, especially when they're in the majority, but in a state that leans the opposite way from their party. For example, say you are a Republican, from a left-leaning state like Maine. You might not want to appear to be siding with Democrats in trying to outright block a nominee but want to wait to announce your final vote. But that is not what happened with Collins.